With the work Telemistica, Jankowski plunges into the medial world of the Italian local TV. 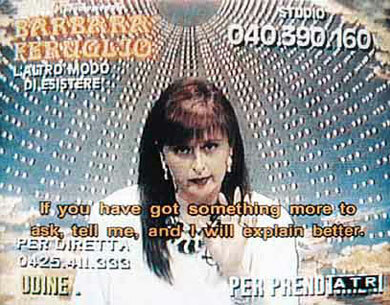 Speaking live on telephone with several TV-fortunetellers he asks questions about his forthcoming artwork. The TV sequences are recorded and are Jankowski's later artwork. Here the mystic not only lays in the private prophecy but gains significance within the work as it prophecies itself.